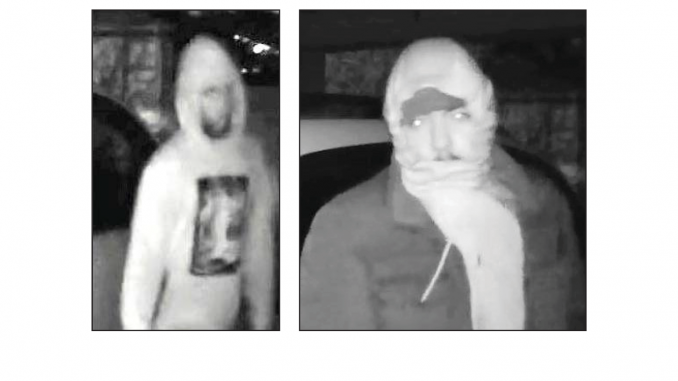 Palo Alto police released these photos from surveillance video of the burglars of a house on Ellsworth Place. Police are searching for armed burglary suspects who may have attempted to steal items from the same Palo Alto home twice in the last two months. The most recent burglary was reported on Jan. 16 at the house in the 700 block of Ellsworth Place. Two suspects forced open an exterior door at 11:29 p.m., entered the home and remained inside for about two minutes, according to police. A resident in his 20s had gone to investigate the sound, believing it came from a woman in her 60s living in the house. He yelled to ask what she was doing and checked a security camera application on his phone when he discovered two men had broken into the house. One of the suspects appeared to be holding a rifle, and is described as a Hispanic man with a medium build, a mustache, dark-colored jacket and hooded sweatshirt. The other suspect had a beard, light-colored hooded sweatshirt and pants. Police said nothing was stolen and the suspects were likely startled away after hearing the man call out. The house was also targeted by burglars in the first week of December, and the woman was inside the home when they broke in a side door. The suspects didn’t enter the home after realizing it was occupied and the victim saw them flee in a white sedan, according to police. Detectives said similar crimes have not happened in the neighboring area. Anyone with information is asked to call Palo Alto police dispatch at (650) 329-2413.